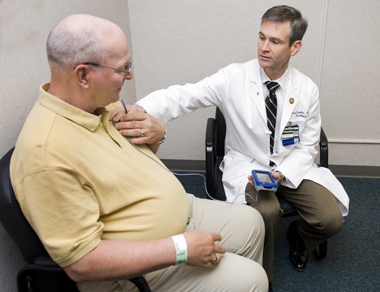 A long-term Vanderbilt University Medical Center study of deep brain stimulation (DBS) in early-stage Parkinson’s disease has received approval from the Food and Drug Administration (FDA) to continue in a pivotal, phase III, large-scale safety and efficacy trial. Approximately 350 patients will be recruited at 15 academic medical centers in the United States and Europe for this Vanderbilt-led study. For more information about enrollment, call (615) 343-2961. “This research has been decades in the making, and we are so excited to receive this approval to expand the trial. We’re one step closer to answering the big question —can early DBS improve quality of life and slow the progression of disability?” said David Charles, M.D., chief medical officer of the Vanderbilt Neuroscience Institute and principal investigator of the study. Co-investigators leading this research effort include Peter Konrad, M.D., Ph.D., professor of Neurosurgery and director of Functional Neurosurgery, Thomas Davis, M.D., professor of Neurology and director of Movement Disorders, and Joseph Neimat, M.D., associate professor of Neurosurgery and director of Human Neurophysiological Research. Parkinson’s disease, believed to affect as many as 7 million people worldwide, is a progressive motor system disorder resulting from the brain’s inability to produce the chemical dopamine, which causes nerve cell death and leads to tremor, slow movement, stiffness and difficulties with balance and walking. In 1996, Vanderbilt was one of the first centers in the nation to implant DBS devices, which insert a thin wire into an area deep in the brain. The wire runs to a small pulse generator installed just under the collarbone, similar to a heart pacemaker, which emits a tunable electrical current. When activated, the electrical stimulation reduces the symptoms of Parkinson’s. Standard of care for Parkinson’s uses DBS only in advanced-stage patients whose symptoms are not adequately controlled by medication. But Charles and his colleagues wondered if DBS applied in early stage disease would be better than oral medication and also slow the progression of the disability and improve quality of life. “We believe strongly and have always been working from the controversial point of view that DBS and medication is better than medication alone,” Charles said. With an estimated 50 percent of dopamine-producing cells already degenerated when a patient first shows symptoms, time is of the essence in applying any therapy that may slow the progression of Parkinson’s. “Half the cells you are trying to save are already gone the day you make the diagnosis. We stand behind early DBS because we believe the treatment could stave off the loss of more of those cells,” Charles said. In 2006, VUMC embarked on a landmark trial — the first and only of its kind in the world — to test the safety and tolerability of DBS in early-stage Parkinson’s disease. The study recruited 35 patients who had been on medication an average of 2 years. After a thorough explanation of the risks, patients were randomized to a DBS group or a standard of care control group. The results of that study are in press. “We found that early stage patients would enroll in a trial that included an invasive intervention, and we were amazed that only one subject withdrew over the entire course of the trial. Many in the DBS group were working and golfing and said that most people didn’t believe they had Parkinson’s,” Charles said. To learn more about this research, call Vanderbilt University Medical Center at (615) 343-2961.